Just another cliche political conspiracy action thriller, but definitely a fun ride! Movies like this one often receive flack for not having a cinematic narrative to accompany the larger than life display on screen. 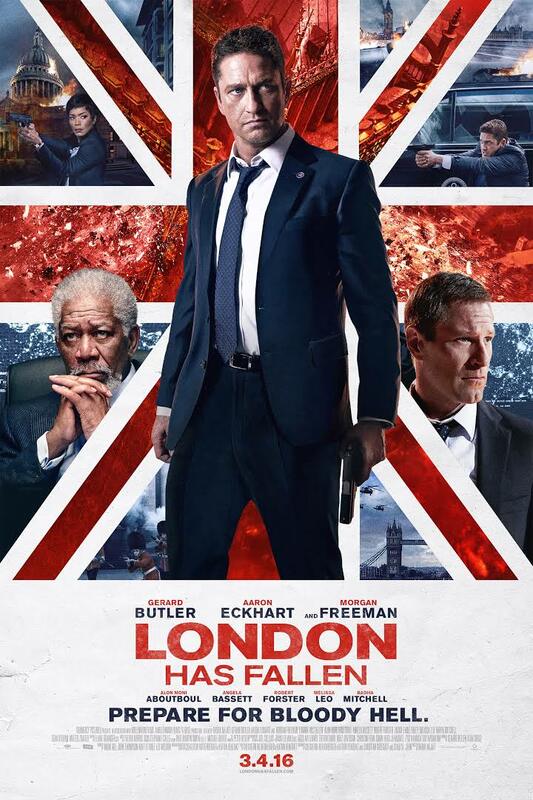 However, I like to look at movies such as London Has Fallen or last year’s Olympus Has Fallen as a way to experience great shallow spectacle and some laughs for a couple of hours. One of the chief reasons that this film is fun and exciting to watch is the cast. Gerard Butler, Aaron Eckhart, accompanied by the phenomenal Angela Bassett, and Morgan Freeman will have your attention throughout the story. It is very important for an otherwise cliche action political thriller to contain excellent actors who can add that touch of quality that films in this sub-genre of action need. A side effect of this film could be heightened awareness to the unrest in the middle east and terrorism when you least expect it. There really isn’t much to dissect or analyze in this movie, so it is one of those that you take for what it is. An action-packed couple of hours that is thrilling with some laughs here and there. The Prime Minister of the United Kingdom is dead, and his funeral becomes the most highly secured event on earth. Politicians and leaders from all over the world gather to mourn the loss of a beloved leader. Along with the other world leaders, the U.S. President is also in attendance. When tragedy strikes at St. Paul’s Cathedral, many are left dead and injured. Just when the UK and the rest of the world thinks it can rely on its own military and palace guards, the terrorists have infiltrated the very inner workings of England’s security, military, and public safety. No one can be trusted. Armed with his “bourbon and bad choices,” secret service agent Mike Banning (Gerard Butler) protects President Asher (Eckhart) and Secret Service Director Lynn Jacobs (Bassett) and tried to get them to safety when all hell breaks loose. Vice President Trumbull (Freeman) must helplessly watch the terror unfold. Just when things couldn’t get any worse, Asher winds up in the hands of the terrorists and Banning must rescue him before he is publicly executed online. What a weekend for movies. You have your choices of this one, Zootopia, Whiskey Tango Foxtrot (which I am seeing tonight), and more. Really looking forward to Tina Fey’s movie tonight. It may sound cliched as you mentioned, but it doesn’t half sound like fun. It’s an action movie. Plain and simple. For what it is, it was an enjoyable visual spectacle on screen. Sometimes I love to just sit back, switch off my brain and watch an action movie. That is pretty much what you have to do with this one. And I agree, like you I enjoy switching off my overly analytical brain and just watch a mindless action movie. Haha. But, I am SOOOOOOO excited for “WTF” tonight! It’s fun to just watch a movie that doesn’t require much brain power. We loved it! Was it ridiculous? Yes. But it was a fun ride! A perfect R-rated action movie.